Families Thrive is a comprehensive, brain-based training that integrates CSSP’s Strengthening Families™ and Youth Thrive into a single intensive training experience aimed at helping professionals respond to youth and their caretakers in ways that increase engagement and the likelihood of healthy developmental outcomes. The training devotes a session to each of the protective and promotive factors – knowledge of child development, social connections, cognitive & social/emotional competence, concrete supports in times of need, and resilience – and teaches practical techniques for applying the framework in programs, practices, and communities. 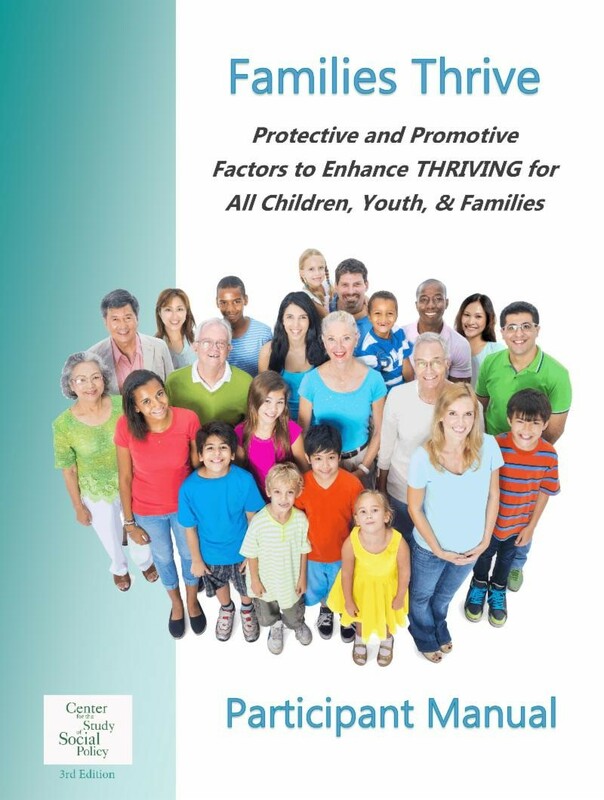 See a two-page review of the evidence supporting the promotive and protective factors framework and showing how that evidence aligns with the Administration on Children, Youth & Families’ own research. The training is delivered in seven modules, or sessions: one introductory; one for each of the five protective/promotive factors; and one in closing that asks participants to plan concrete steps for implementing the approach in their work setting. Following is a breakdown of learning objectives by session. You may register for either the Practitioner Track or the Training of Trainers Track. The Families Thrive Practitioner Track runs from March 25-28, from 9 a.m. to 5 p.m. each day. Regardless of training track, each day includes a one-hour lunch break on your own. Food is available nearby. Several short breaks with refreshments will also be provided. Following training, each participant joins the Thrive Community of Practice and will receive additional resources and updates as they become available. Following training, each trainer joins the Thrive Community of Practice, will be involved in ongoing development of the curriculum, and will receive additional resources and updates as they become available. Parking: Parking on the University of Denver campus costs $10 per day, and a parking pass must be purchased in advance through Youth in Focus. You can pay online when you register. The training is provided by Youth in Focus, a collaborative of organizations working with the Center for the Study of Social Policy to disseminate the Youth Thrive™ and Families Thrive curricula and materials. Collaboration members are Academy for Competent Youth Work, Bolster Collaborative, Health Care Education and Training, National Safe Place Network, Phillips Programs, and Youth Catalytics.